For years, we've been stuck with planners that force us into the same boring planners page after page. Every. Single. Year. Year after year. It's no wonder many people give up on their goals! Yes, action is a big part of achieving goals but seriously! Who gets all pumped opening up their day only to see boxy blocks with unending lines of to-do's daily? Nobody. 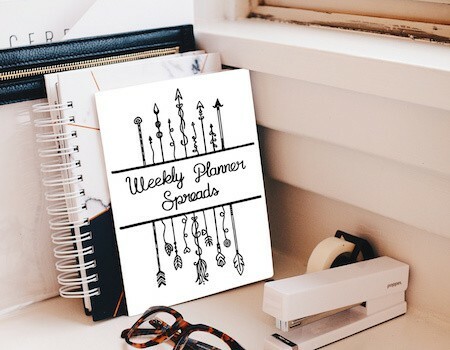 And that's why we have designed these printable for your planner. Inject some fun and beauty into your week while creating daily habits. The brain loves fresh, shiny new objects. So swap out your weekly spread every week to get that shiny object feeling and keep your excitement level up as you dig deeper and closer into your projects. With 6 different designs, you can keep things interesting every 6 weeks! Don't stop there. Because the pages are designed to be color-friendly, no two weeks need to be the same even when you re-use the designs. Color them differently each week. Mix up the designs. On top of that, because you get editable versions of the planner, you can even move things around. You'll get 3 additional divider pages complete with motivational text to help sweeten the pot for your customer so this will be a no-brainer purchase for them. Get it now before I decide to pull the extras. When that happens, you'll pay the same for less.